Curcumin has been used in traditional Chinese medicine for thousands of years for a variety of conditions; mainly for breaking up blockages and for their anti-inflammatory effects. Curcumin is a pharmacologically active substance, prepared by extraction from Curcuma longa. To increase the absorption of a large number of active substances, piperine and quercetin is added to curcumin. 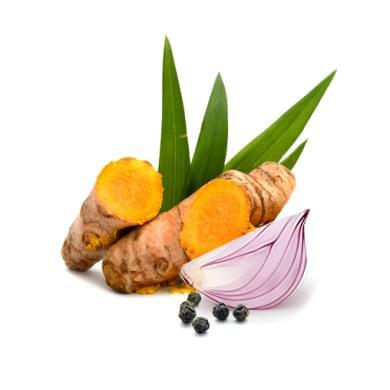 Thanks to a special form of extraction, we offer a high quality minimum 95% extract of curcuma longa at an ideal ratio of active ingredients for best results. Piperine (95% pepper extract) and quercetin bioflavonoide are added for the better absorption of active ingredients. Curcumin is not a mushroom, yet we believe that because of its ability to break blockages and also reduce inflammation it will find usage simultaneously with medicinal mushrooms regarding a large range of problems. We use highly concentrated curcumin for a stronger effect. Curcumin itself is very poorly absorbed by the human body, so we add a small amount of pepper (piperine) and quercetin extract to curcumin, which increases absorbability up to 2000%. Piperine and quercetin block the enzyme in the digestive system that would otherwise very quickly divide curcumin into a number of ineffective metabolites. In this way the undisturbed curcuma reaches the bloodstream and the cells themselves faster. Curcumin is a yellow dye derived from curcuma longa. It is a lipophilic phenolic substance that has significant effects on human health. According to studies it has antioxidant and anti-inflammatory effects. Learn more about the effects of curcumin in Book of Mushrooms. You can find more information about effects of Curcumin at Mushroom Collection. The product MycoMedica Curcumin was approved by the Czech Republic Ministry of Health under the ref. no. OVZ-35.1-21.04.2011-45938.